Quality hard drive repair companies are hard to come by. At Secure Data Recovery we strive to deliver reliable data recovery services and remarkable results. Our state of the art facilities and advanced technologies allow us to do just that. We operate certified Class 10 ISO 4 Cleanrooms in order to ensure continuous safety of your device when in our care. 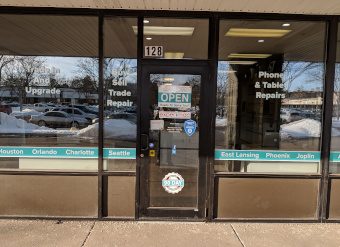 Secure Data Recovery is now conveniently located in East Lansing, MI. Giving many businesses and college students access to local data recovery services. Because, nothing is worse than your hard drive failing right before your paper is due. Secure Data has proven its ability as a data recovery company by cautiously upholding a 96% overall success rate. In other words, if your computer fails the day before you project is due, call our 24 hour customer service line for immediate help. Regardless of the type of media you have, we can recover data from virtually any device. Regardless of your media type or the cause of data loss, our Lansing location offers a range of services to quickly recover your files. See some of our featured data recovery services below. Secure Data will always deliver the best results possible, and if, by chance, we cannot recover your data, we will issue a refund, standing by our no recovery, no charge guarantee. When you start a case with us, we will provide you with online case monitoring tools. That way, you can check on the progress every step of the way. At the same time, out engineers will begin by quickly identifying the root of the problem and assessing the damage. Next, they can start the repair and recovery process. Call our award winning customer services team today for help with data recovery services in East Lansing, MI. They can start your case for you and provide information on convenient drop off and pick up locations. Call Secure Data for all of your data recovery needs today! Ryan did a great job walking me through the whole process. It took me a little while to actually get the memory card sent in due to business travel but he was patient throughout the whole process. The last three years of my life pretty much was on that memory card, can't thank you guys enough for getting the data back! I had a complete hard drive failure and had not been diligent in keeping my backups current. I researched several companies both online and local and chose Secure Data Recovery Services. They were AWESOME! While the service isn't cheap, they were extremely responsive every step of the way and were able to recover 100% of my data. A huge shout out to Fred Wright, he was an outstanding representative!! Full Recovery - Alex was very helpful! Your daughter’s hard drive crashes and she lose precious data. Irreplaceable photos of Mom who just passed away and Oscar the most adorable and loving Bull Mastiff ever created. With no help from any national electronic and computer services stores, the Secure Data Recover Services, upon the recommendation of a computer supplier to Kettering University, was contacted as a last resort. Within days a very personable and very knowledgeable person by the name of Alec Sakenes contacted me and explained the process of recovering data from the defective hard drive. Within a week Alex was able to inform me that a complete data recovery was achieved – wow, what a relief. Best news yet this year! My only regret was that I wasted about four months dealing with what was obviously unprofessional and inept stores and their representatives. Having troubles with your hard drive, contact Alex Sakenes at Secure Data Recovery Services. Alex will lead you through the entire process and keep you promptly informed of the status of the process. I will make sure that management is aware of Alec Sakenes' great demeanor and customer service skills. Also I am glad that you had a great experience with our company!